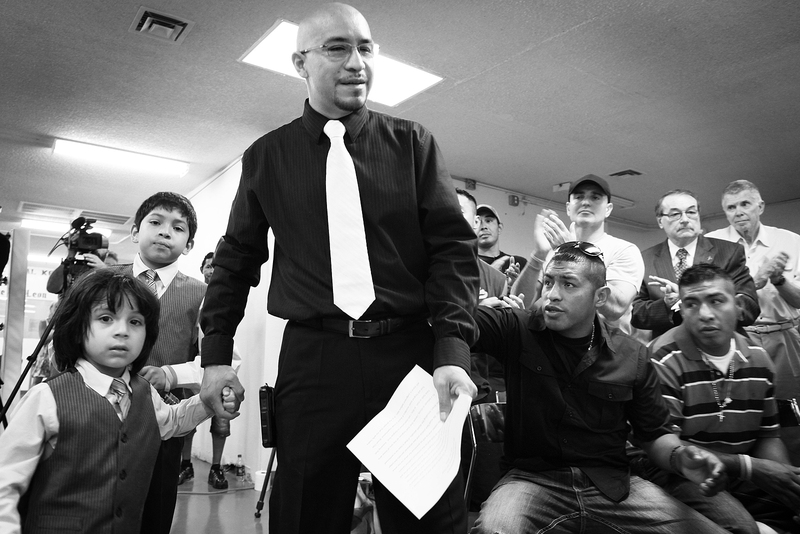 Arturo Martinez-Sanchez gathers his composure and wipes away tears with his son Cristopher, 9, in his office before a press conference at his gym, Real KO Boxing Club, in North Las Vegas July 12, 2012. Martinez-Sanchez’s wife and 10-year-old daughter were beaten to death in their home in April 2012, and Martinez-Sanchez was hospitalized with severe head injuries from the attack. Arturo Martinez-Sanchez is sitting in a private area of the church, the sacristy behind the altar where he is out of view of the congregation. From here he can hear a choir softly singing as his wife and daughter are wheeled forward. They are in matching white caskets. The one containing the body of 38-year-old Yadira is distinguished by red roses; the roses on top of 10-year-old Karla’s casket are purple. 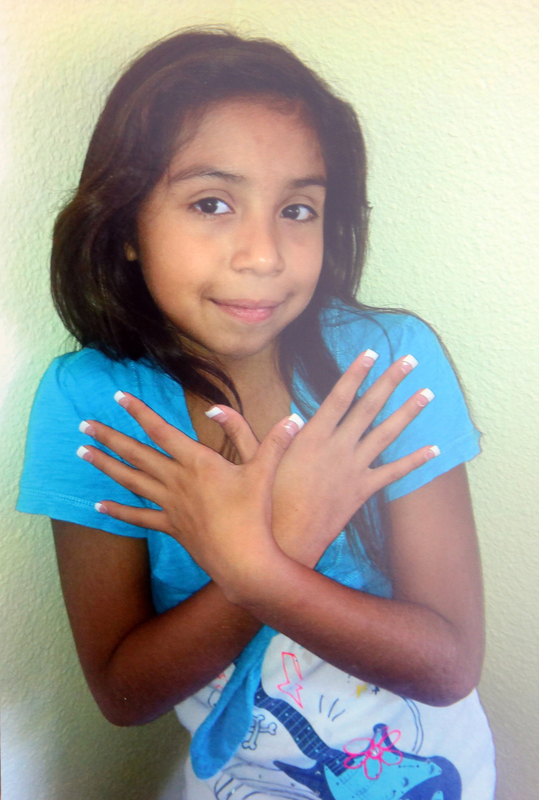 It’s May 2012, nearly a month since Yadira and Karla were brutally killed, and even if the shock has worn off, the community still quietly seethes. The church is filled with family — including Arturo’s two sons, Cristopher and Alejandro — friends and strangers. Reporters wait across the street; Arturo isn’t ready to face them quite yet. No funeral Mass comes without heartache, but this one stings for the Rev. 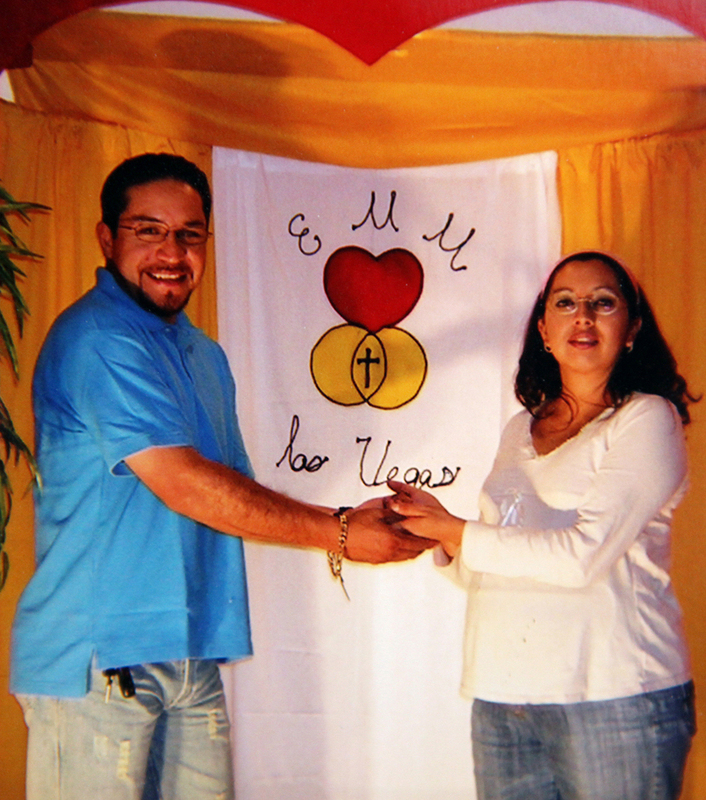 Julio Alberto Alzate, co-pastor of St. Christopher Catholic Church in North Las Vegas. He ate meals with this young family. He baptized their three children. And he is the godfather of 9-year-old Cristopher, the middle child who walked to school and reported the deaths. The Rev. Julio Alberto Alzate speaks about Arturo's willingness to forgive. Translation: "He is an example of teaching us how to forget lived events that reside deep down in our heart and teaches us to live in peace." Now, Alzate finds himself alongside the two caskets, asking a community to find the strength to forgive the evil that shattered this family. On this Friday morning in May, 22-year-old Bryan Clay is in a Clark County Detention Center jail cell, accused of sexually assaulting a 50-year-old woman in a gravel-strewn lot at Vegas and Tonopah drives, then traveling several blocks and entering the home at 1016 Robin St. Inside, police say he viciously bashed the heads of Arturo, his wife and daughter with a hammer. Police allege he also sexually assaulted Yadira and Karla. Arturo survived, along with 9-year-old Cristopher and 4-year-old Alejandro, who slept through the attacks and awakened to a house of horrors the following morning. Funerals, it’s said, help with the healing process. They help bring closure, as if that’s possible. Alzate speaks in his native Spanish, and his co-pastor, the Rev. Ron Zanoni, adds a few words in English, asking mourners to pray for a path to healing and peace. “That is our prayer for all of us and all those who suffer the tragic effects of violence,” Zanoni says. Cristopher helps uncles carry the caskets. They pass a vestibule filled with photos from brighter days and wreaths adorned with messages from loved ones. 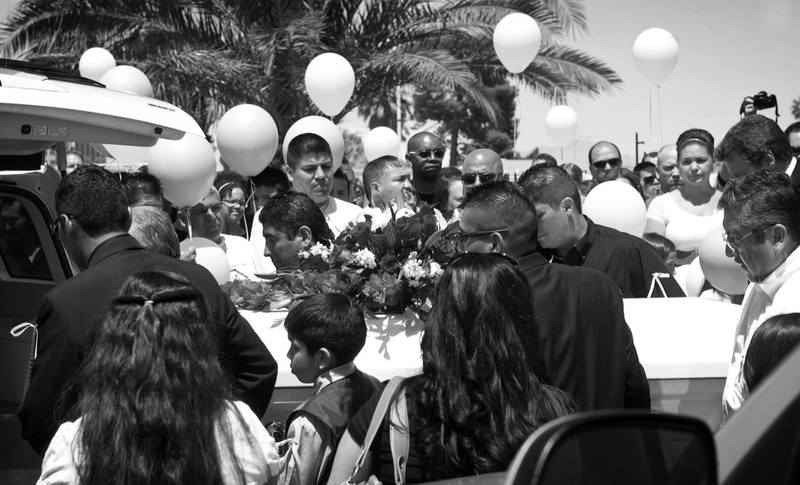 Yadira and Karla Martinez's caskets are carried out of St. Christopher Catholic Church on Friday, May 11, 2012, after their funeral service. Karla is seen grinning sweetly, posing with freshly manicured nails and performing splits on a pool table. Her mother smiles broadly for the camera while holding a drink at a restaurant. Outside, mourners hold white and lavender balloons. A few slip away, drifting into the sky. Pallbearers hoist the caskets into two awaiting Cadillac Escalades. From here, they will drive a half-mile south to Woodlawn Cemetery, where mother and daughter will be buried in a single grave. Until now, this family had seemed blessed, succeeding in ways beyond their humble reach. 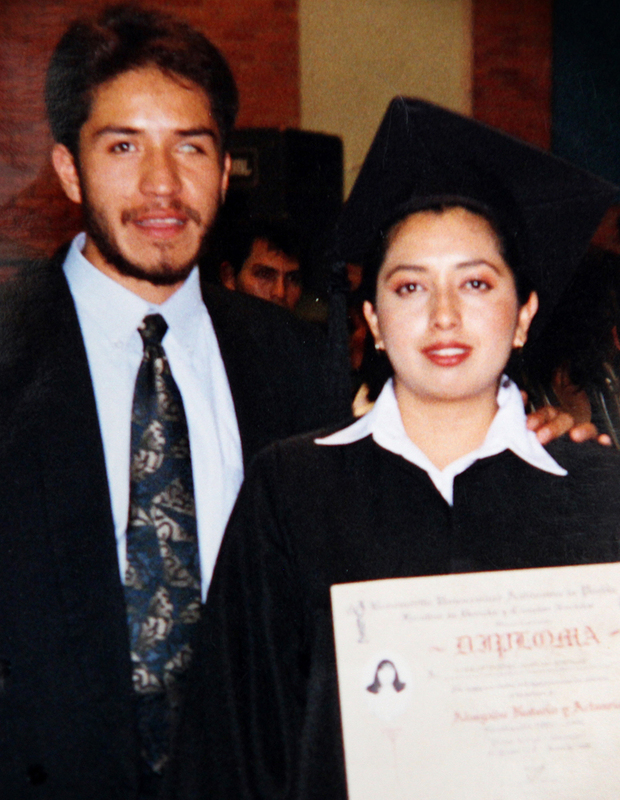 Arturo and Yady, her nickname to family and friends, met on a college campus in Puebla, Mexico. It was 1992 and they were law students. Arturo’s nonchalant demeanor didn’t deflate Yady’s hopes. They exchanged greetings several days later. After a few more days, they again ran into each other. It was two weeks before the impatient Yady boldly struck, planting a kiss on Arturo. It spurred Arturo to finally ask her out on a date. For the next six months, they were inseparable in their spare time but, by college standards, were not considered “a couple.” The uncertainty reduced Yady to tears on her birthday, Feb. 1. He asked her to be his girlfriend. They remained true to one another, even as Arturo took time off from school to care for his ailing mother in Mexico City. He never did finish school. Arturo sold shoes door to door, which led to his opening a shoe store in Yady’s hometown of Hidalgo. The store reaped $300 a month, not enough to get ahead financially. After Yady graduated from college, Arturo decided he could make a real living by moving to the United States. Unable to secure a visa, he would have to cross the border illegally. To his surprise, Yady said she wanted to go along. She clued in her parents, and her father had but one question: What is your relationship with this man? They were getting married, Yady said, and three days later, they did. They wed Nov. 27, 1997, at a simple ceremony in a government building. She wore a navy blue pantsuit with red shoes; he wore khaki slacks and a light blue dress shirt. The newlyweds tried to cross the border together twice with the help of coyotes — smugglers operating an underground network to sneak people into the United States — but U.S. Border Patrol agents caught them each time and returned them to Mexico. Arturo decided to go alone and then make arrangements to bring Yady. He succeeded on his fifth solo try on foot, a 3 1/2-day trek that ended safely in Anaheim, Calif. He didn’t know whether he could trust the coyotes to return with Yady, but several days later, they dropped her off not far from Disneyland. They scrambled for jobs. Yady found work at a fast-food restaurant. Arturo secured day-labor gigs — moving rocks, cutting grass, mopping, anything to earn a buck. After four months, they accepted a woman’s offer to drive them to Las Vegas, a city booming with construction and new jobs. Arturo paid her $300 for the ride, an amount he would later realize was heftier than two bus tickets. But they arrived safely, carrying only a bag or two, and that’s all that mattered. Using fake Social Security cards they got from forged-document peddlers, they easily snagged minimum-wage jobs, including work at a fast-food joint near Rainbow Boulevard. At another place, Arturo made burritos. The long hours paid for rent; a yellow, older-model Toyota Corolla; and, eventually, their first home: 1016 Robin St. They bought the fixer-upper home for $93,000 in December 1999. 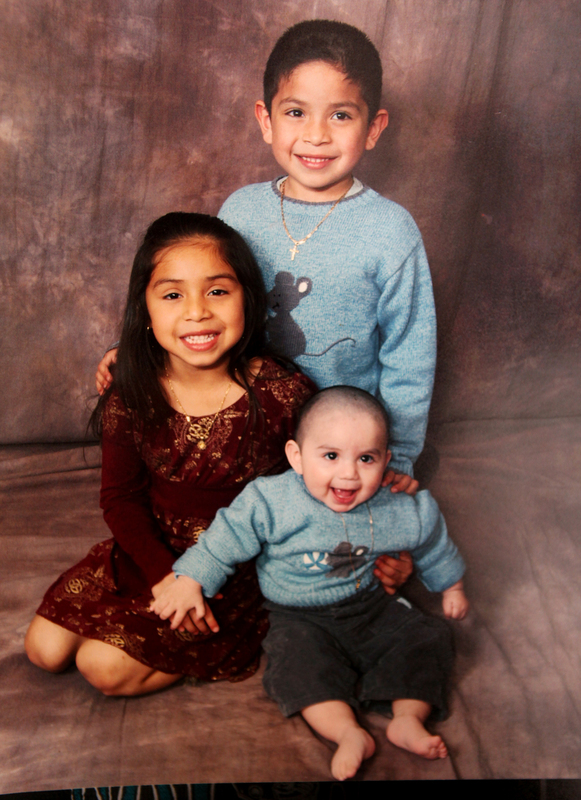 Arturo landed a stable union job as an electrician to suit his growing family. Within a few years, he worked his way up to foreman, making $22 an hour. He felt good about his decision to move with his bride to the United States. Two little boys followed — Cristopher, born in the summer of 2002, and Alejandro, five years later. The couple enrolled their children in after-school activities: sports, music, acting classes. They bought the kids a trampoline for the backyard, took vacations to California and spent weekends at church and with extended family. Expectations for their growing children were simple: Earn A’s and B’s at school. “That’s my goal and that’s their goal, too,” Arturo says. As his kids grew, Arturo began working out at a gym operated by former boxing referee Richard Steele. It renewed his passion for the sport. During his teen years, he had fought a dozen amateur boxing matches, winning all but one. There, amid the sweat and burning muscles, a thought occurred to him: What if he opened his own gym? Yady encouraged him. So did the kids. In April 2011, using money they had saved, the couple opened Real KO Boxing Club. They rented a storefront in an aging North Las Vegas plaza painted white with a blue roof. For two months, they worked nights and weekends to spruce up the interior. They envisioned the gym being a community gathering spot for children and teens living near Cheyenne Avenue and Civic Center Drive. On opening day, seven people enrolled. As word spread, registration increased, keeping Arturo and his family busy in the evenings. The gym wasn’t their money-maker, but it was a dream realized. Not all dreams last, though. Two weeks after Alejandro was born, the young family moved to North Las Vegas into a newer, bigger home — a purchase they felt confident about after cobbling together enough money for a down payment. They rented out their Robin Street house. But the region’s emerging housing crisis took its toll on Arturo and Yady, like it did for countless other Southern Nevada homeowners. When escalating payments grew beyond their means, their home fell into foreclosure. In December 2011, the family returned to its Robin Street home. Arturo and Yady considered it an unfortunate setback, not an end to their way of life. Cristopher Martinez, 10, gets a hug from his aunt, Gaudia Martinez-Sanchez, at her home in Las Vegas before his first day of school Aug. 27, 2012. These days, Arturo and his two boys live with his sister, Gaudia Martinez-Sanchez, whose words encouraged him to start fighting as he lay hospitalized at University Medical Center. But Arturo knew he and his boys could never fall asleep again inside 1016 Robin St. They needed a place to live. In February 2012, Gaudia’s husband, Ken Seal, had bought a sprawling, ranch-style home along a quiet street to accommodate the couple and his wife’s teenage son, Jesus Vazquez. They didn’t quite know what to do with the extra space, but the house called to them. Now the home has purpose. Several days after the funeral, they all move into the house, complete with a backyard pool. This allows Arturo to focus on his physical recovery. He begins physical and occupational therapy May 15 at the Nevada Community Enrichment Program, a day treatment program tailored to people with brain injuries. 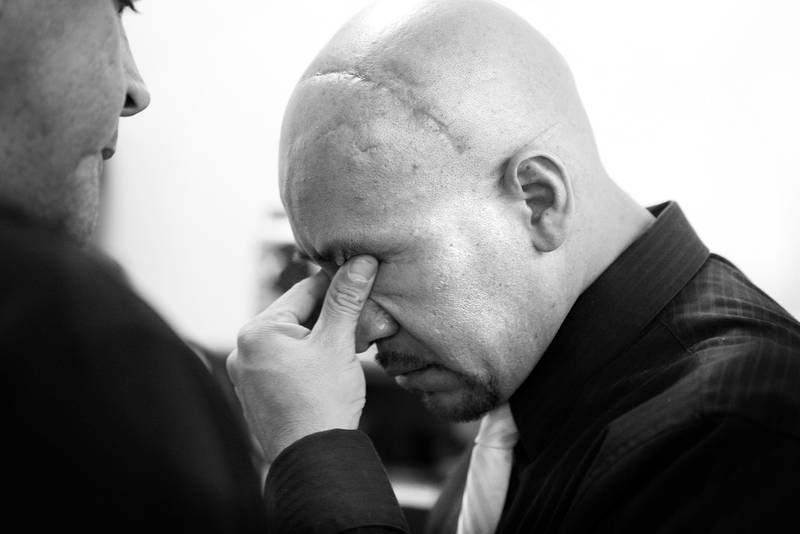 Arturo’s injury is considered traumatic — in other words, the result of a blow to his head rather than an unprovoked medical episode. His injury led to memory loss as well as coordination and speech difficulties. Arturo Martinez-Sanchez is seen at his gym, Real KO Boxing Club, in North Las Vegas July 6, 2012. Martinez-Sanchez's wife and 10-year-old daughter were beaten to death in their home in April 2012; Martinez-Sanchez was hospitalized with severe head injuries from the attack. It’s obvious to everyone who greets him at the treatment program. He falls over if someone bumps into him. He doesn’t know the date, month or year. He recalls loved ones but becomes confused easily. Weeks pass, then months. Arturo improves enough to pass a driving test, regaining his license. For this 39-year-old man, that’s a milestone worth celebrating. It means more independence. Arturo Martinez-Sanchez undergoes cognitive and speech therapy with Julie Peterson at Nevada Community Enrichment Program, a therapy program for people with brain injuries, in Las Vegas Aug. 20, 2012. But impediments remain, which is why Arturo is sighing on a Monday morning in late July. He’s sitting at a table with his speech therapist, Julie Peterson. He has reviewed a paper listing ways to improve one’s memory, but now his cheat sheet is gone, and Peterson wants him to recite the strategies. He nails four, no problem: repeating information, writing things down, taking video and using iPhone applications. After a pause, he adds one more to the list: daily routines and rituals. He’s halfway there, but he’s stumped. “How do you organize your day? What do you keep that information on?” Peterson asks, guiding him to another answer. The pair slog through the remaining tips, with Peterson issuing prompts so Arturo can connect the dots. Defeat etched on his face, Arturo tries to muster a smile. Erasure marks clutter his papers by the end of the session. Arturo often writes the wrong letter, a key indicator of his motor-programming shortfalls. His brain struggles to connect his thoughts with his actions. So, by 11 a.m., his brain needs a break. It’s time for more physical therapy. Cued by his physical therapist, Christine Solan, Arturo folds his arms and stands on one leg. With his right foot lifted, he wobbles back and forth. He balances for 30 seconds, uncrossing his arms only once at the 15-second mark. His time is consistent with what any uninjured person his age should achieve. 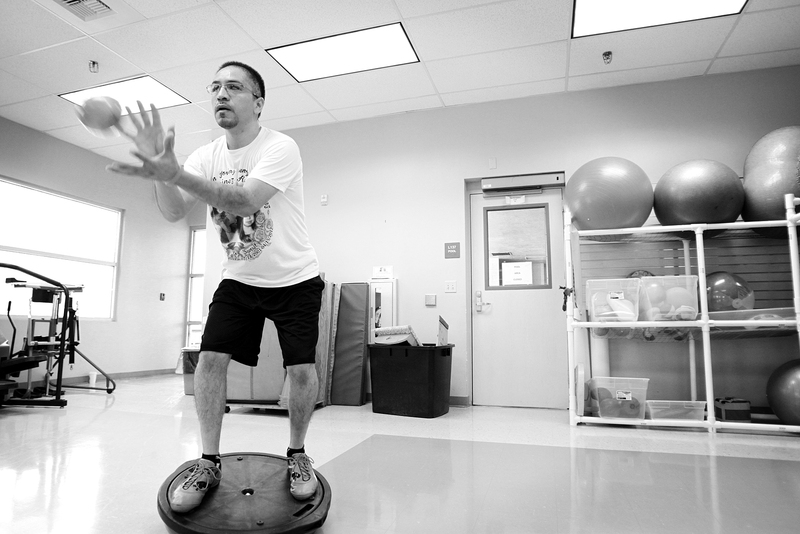 Arturo Martinez-Sanchez undergoes physical therapy at Nevada Community Enrichment Program, a therapy program for people with brain injuries, in Las Vegas on Aug. 20, 2012. The former amateur boxer can only last three seconds — well below the 23-second threshold most people could meet. Less than a month later, on Aug. 23, Arturo has improved in all areas — so much that it’s his graduation day from the Nevada Community Enrichment Program. Gaudia attends along with Cristopher, Alejandro and Arturo’s sister-in-law, Lupita Olmedo. In a large room filled with workout equipment and mats on one side and tables on the other, a small crowd has formed. Arturo’s case manager, Jerry Kappeler, stands next to him and rattles off a list of accomplishments: Arturo speaks in more complex sentences and has better balance, improved hand-eye coordination and more strength. Their initial handshake was wimpy at best. “Now, he crushes my hand,” Kappeler says. Arturo is their role model — their reason to hope that one day, they, too, will graduate. But in the world of brain injuries, recovery doesn’t have a finish line. When Kappeler asks Arturo to speak about his memory improvements, he pauses for a long time. Cristopher gives him a hug. “I cannot even remember ...” Arturo trails off, shaking his head and passing that question. 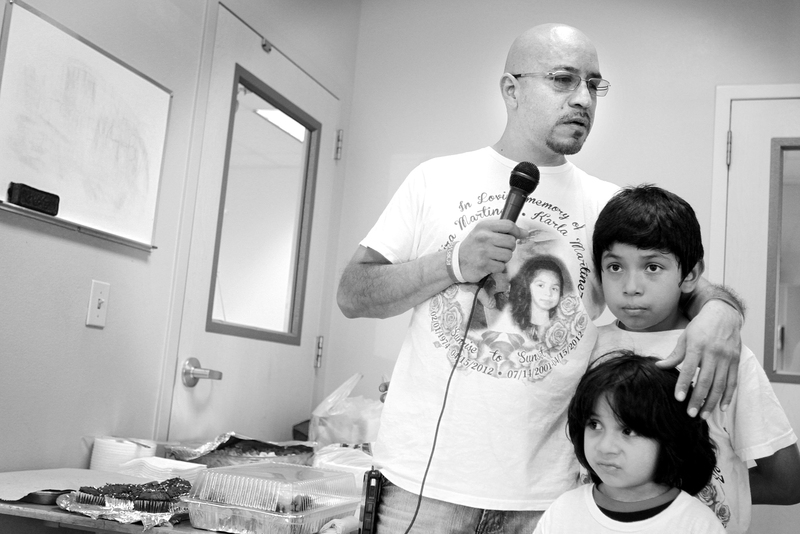 Arturo Martinez-Sanchez, with his sons Cristopher, 10, and Alejandro, 5, speaks during his graduation from therapy at Nevada Community Enrichment Program, a comprehensive therapy program for people with brain injuries, in Las Vegas Aug. 23, 2012. It’s a somber moment in an otherwise triumphant day. Arturo tells his fellow program participants, “God bless you,” and thanks his sister for her relentless support. As Kappeler hands him his certificate of completion, the room erupts in applause, signaling snack time. Gaudia brought homemade flan. What’s the key to human resolve? Is it an inner strength, embedded in the human consciousness from birth? Or pure grit exhibited by those facing adversity? Scholars and theologians can debate. For Arturo, a former altar server rarely seen without a rosary around his neck, the answer came in early summer: He must forgive. It’s a commandment and a survival necessity. Arturo Martinez-Sanchez walks with his two sons, from left, Alejandro, 5, and Cristopher, 9, during a press conference at his gym, Real KO Boxing Club, in North Las Vegas July 12, 2012. Martinez-Sanchez's wife and 10-year-old daughter were beaten to death in their home in April 2012; Martinez-Sanchez was hospitalized with severe head injuries from the attack. Arturo shares his feelings with Alzate, a gentle confidant who listens rather than pontificates. He understands Arturo’s desire to move on with his life. In the grief-stricken man before him, he sees an act from the heart. On a hot summer day in early July, Arturo invites the community back to his gym to announce its reopening and offer a personal message. It’s his first appearance in front of reporters since the attacks. He wears a black collared shirt and black slacks, accented by a white tie. Cristopher and Alejandro don matching grey vests. As Arturo makes his way to a front table, the boys clutch his sides. 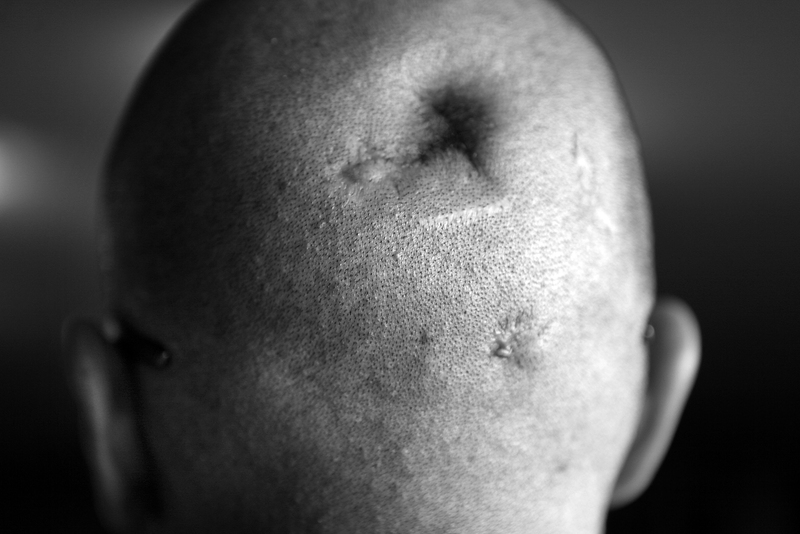 And, for the first time, those seated in metal chairs in the gym can see Arturo’s physical wounds: a deep, red scar running from above his left ear to the top of his head and a marble-sized dent on the back of his head. 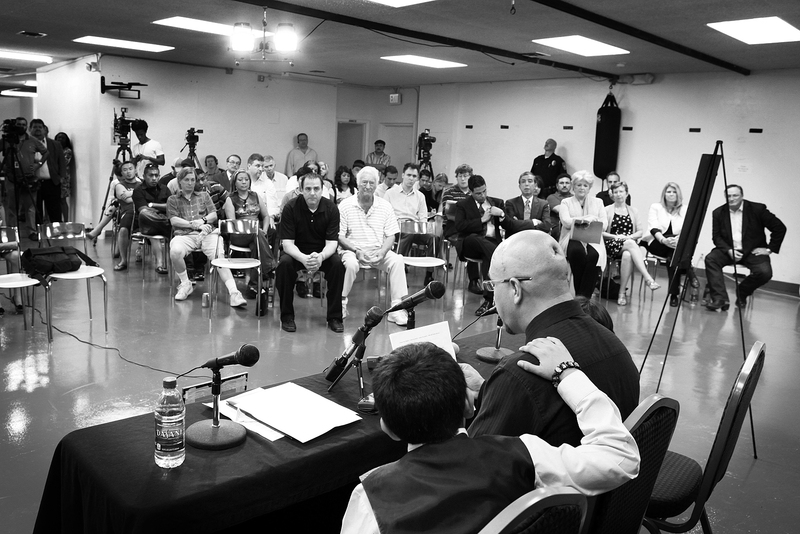 Arturo Martinez-Sanchez is consoled by his son, Cristopher, 9, during a press conference at his gym, Real KO Boxing Club, in North Las Vegas July 12, 2012. Martinez-Sanchez's wife and 10-year-old daughter were beaten to death in their home in April 2012, and Martinez-Sanchez was hospitalized with severe head injuries from the attack. Arturo Martinez-Sanchez gathers himself in his office before a press conference at his gym Real KO Boxing Club, in North Las Vegas on July 12, 2012. 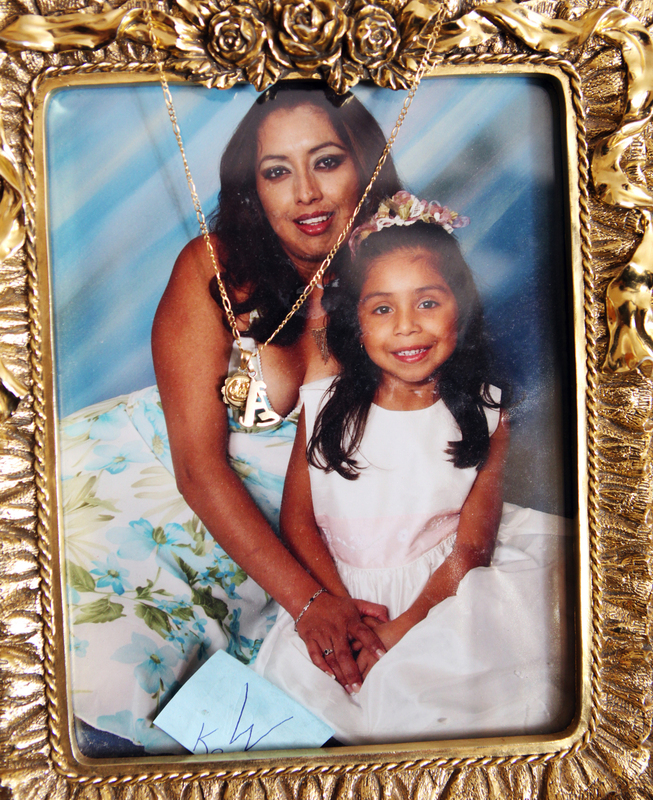 Martinez-Sanchez's wife and 10-year-old daughter were beaten to death in their home in April 2012, and Martinez-Sanchez was hospitalized with severe head injuries from the attack. Arturo Martinez-Sanchez reads the forgiveness statement he wrote about the person that killed his wife and daughter. With tears streaming down his face, he speaks of his once-happy family, the forgiveness of sins, and his solace knowing he will spend eternity with his wife and daughter in heaven.